The power of Christmas is best understood by those that do not rush into the celebration of the birth of Christ immediately after Thanksgiving Day. Christmas should come after we, like ancient Israel, have had to wrestle with waiting for our Savior to come. That is what the season of Advent is meant to accomplish; four weeks between Thanksgiving Day and Christmas Sunday when the church awaits the joy and peace that will come when Christ finally appears into our sinful and unjust world, bringing with him the promise of peace on earth. Christmas is the time when believers rejoice that the season of waiting is over and the promised Messiah has now appeared. The name of that promised child is Immanuel which means God Is with Us! That is the reason for our rejoicing; God is with us with power and grace and glory. Christians do not rejoice because Santa Claus has come to town even if he comes to the ghetto. Our message is Immanuel; God is with us. On Christmas Sunday we should focus on the blessed assurance that we are not alone in life’s struggles. God is with us. Lebron James left our Cleveland Cavaliers basketball team to “take his talents to South Beach” and play for the Miami Heat. Our whole city felt a sense of loss and abandonment. 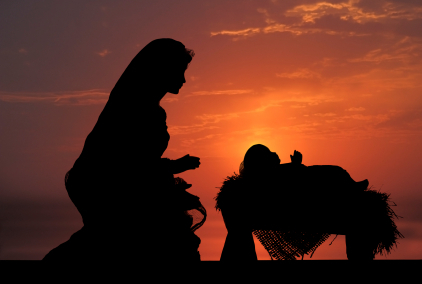 When people or entire communities feel abandoned by someone or something they had earlier valued, it is important to remember that on Christmas Day God sent someone into our world that will neither leave us nor forsake us. There are several Old Testament passages through which Christians have seen the birth of Jesus being predicted, promised or foreshadowed. Among those passages are Micah 5:2, that suggests that the Messiah will be born in Bethlehem, and Isaiah 7:14, that suggests that the Messiah will be born of a virgin. Both of those themes figure prominently in the Christian observance of Christmas and in our understanding of the person and work of Jesus. This passage in Isaiah 9:6 also fits into that category, and it suggests that the Messiah’s birth will result in an era when the government, not always known for working on behalf of all the people, will be established on the principles of God’s justice. The Messiah will be known not so much by his birth name as by the deeds he does and by the impact of his presence. His name shall be called Wonderful Counselor, Mighty God, Everlasting Father and Prince of Peace. People in the eighth century BC undoubtedly saw Isaiah 9:6 as being fulfilled by the birth of King Hezekiah who would reign in Judah from 715-687 BC. Details of his reign can be found in II Kings 18-20. The same can be said for Isaiah 7:14; people in the eighth century viewed this passage as having to do with the imminent threat from the armies of Israel and Assyria that seemed poised to conquer their tiny nation. The passage in Micah 5:2 also had an original meaning, namely that the Messiah that would appear after the punishment that God was about to send upon sinful Jerusalem would come from the line of King David. God’s covenant people would be punished for their sins, but they would not be abandoned. The promise of II Samuel 7:14ff concerning the continuation of someone from David’s line sitting on the throne in Jerusalem would be fulfilled. The covenant would be continued! It is always useful to seek an understanding of these Old Testament passages within their own historical contexts; in the life of ancient Israel and Judah before we appropriate them for our own purposes as Christians. Ancient Israel was literally kept alive by the hope that a Messiah, a savior, a deliverer, would come who would release them from the oppression they experienced from one conquering nation after another from Assyria to Babylon to Persia to Greece to Rome. They lost their land, their temple, their monarchy and their national autonomy. However, they never lost their faith that the Messiah would come. Having made this point about reading these passages within their original historical contexts, it is now time to make the point that Christians have looked back on all three of these passages and seen something that had less to do with the plight of Israel in ancient times, and far more to do with what God was and is doing for all people for all times. Christians have interpreted the words of Isaiah 9:6 as having to do with all of God’s promises about the coming of a savior being fulfilled in the birth of Jesus Christ, as reported both in Matthew 1-2 and in our second text for today Luke 2:8-14. This New Testament text identifies the most direct beneficiary of the birth of the Messiah -- the poor. The angel of the Lord appeared to a group of shepherds gathered on the outskirts of Bethlehem and declared, “To you is born this day in the city of David a Savior, who is the Messiah.” In a world where every advantage is enjoyed by the rich, the powerful and the well-connected, we should not miss the point that God’s appearance was most intended for the poor, the powerless and the marginalized. Many shepherds were hired workers caring for sheep owned by others. Those who cared for their own flocks were nonetheless cut off from normal Jewish life because of their inability to maintain religious purity according to Leviticus 11:39. They were a marginalized group; much like migrant workers in our society today. Instead of being harassed about showing their immigration papers, as in Arizona, these poor laborers were told that God had sent the Savior to them. Christians should understand that anything we say or do that cuts off or leaves out the poor and the dispossessed among us is unacceptable to God and unworthy of the Savior. Colors: White sheep in a flock; the green fields where the shepherds lived; the beige clothes of shepherds; the brightness of the glory of God. Just as Advent is a season that covers four weeks, Christmas is actually a liturgical season that covers two Sundays. In some settings the second Sunday of Christmas is viewed as Epiphany, or the time when the message of joy was extended beyond the shepherds of Bethlehem and was carried to the whole world by the three magi or wise men as reported in Matthew 2. Preachers should take advantage of this second week of Christmas which will offer them another remarkable preaching opportunity. The anticipation followed by joy that is the mark of Christmas can easily carry over one week to a Watch Night service typically held in African American churches on New Year’s Eve. This service is more than the marking of the passing of one year and the arrival of the next. It is also a reminder of the anticipation followed by joy felt by our slave ancestors on December 31, 1862 as they awaited the effective date for the Emancipation Proclamation and the beginning of the end of chattel slavery in the United States. The same anticipation followed by joy came in May of 1954 when the U.S. Supreme Court ruled in the Brown v. Board of Education decision; a ruling that in many ways launched the modern civil rights movement. Preachers should understand that joy is not an emotion that can be understood in isolation. Joy is our reaction when a burden is lifted, a long awaited victory is achieved or a great evil (apartheid or Jim Crow) has finally been defeated. The precious Lamb of God. Those who really want to experience the joy of Christmas should consider a production of Black Nativity by Langston Hughes. That musical drama tells the story of the birth of Jesus with all the soul and substance the holiday (holy day) deserves. The same can be said for the joyful CD entitled Handel’s Messiah: A Soulful Celebration, produced by Take 6 and others. One will be equally uplifted by the joyful strains of the first part of the cantata Born to Die by Glenn Edward Burleigh. Of course, no Christmas is complete without the satin sound of Nat King Cole wishing a Merry Christmas to kids from one to ninety-two. Just to hear the openings strands of that song can put even Ebenezer Scrooge into a joyful Christmas spirit.